Home Tags Posts tagged with "Alameda Sew-Along"
Here it is, the last viedo of the #AlamedaSewAlong! In this video, you’ll see how to insert the invisible zipper, attach the lining with a fellstitch and stitch the hem with bias binding. I hope you enjoyed the videos and the Sew-Along. Let me know if you have any questions and send me pictures of your Alameda dresses when you have finish!!! 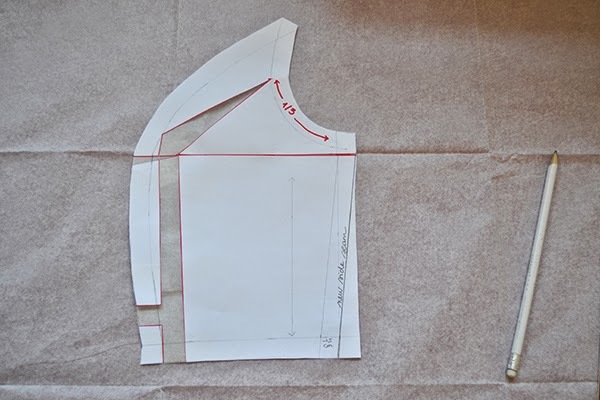 Today we’ll see quite a long step for the #AlamedaSewAlong: we’ll make our complete bodice. The Alameda dress bodice is composed of princess seams and is completely lined. Today, we’ll start with the first video tutorial of the #AlamedaSewAlong! Yeah! I had a lot of fun last spring making the videos for the Carme blouse Sew-Along and you were a lot to tell me that it was a huge help to have these visual tutorials, so here come the Alameda videos! And remember that you can buy it already-made or you can make it yourself! See for yourself on this tutorial I made back in April. To watch the video in Youtube, click here. 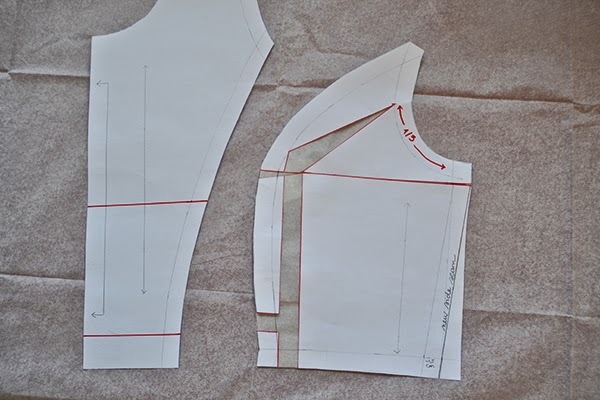 Today we’ll see how to make simple changes to the Alameda pattern: how to lengthen or shorten the bodice and how to connect two sizes together on the skirt part. 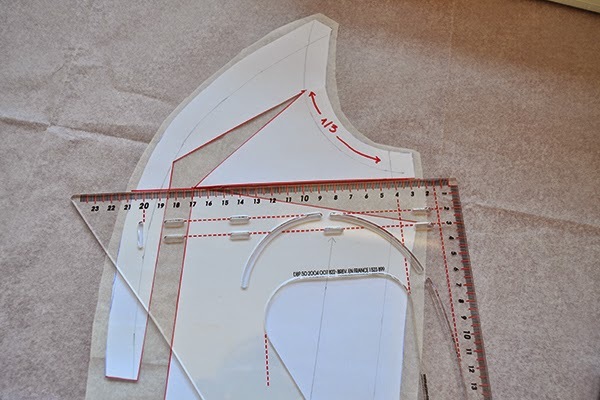 Note: If you have made a Full Bust Adjustment according to the previous tutorial, you have noticed that the front bodice is slightly longer than before. 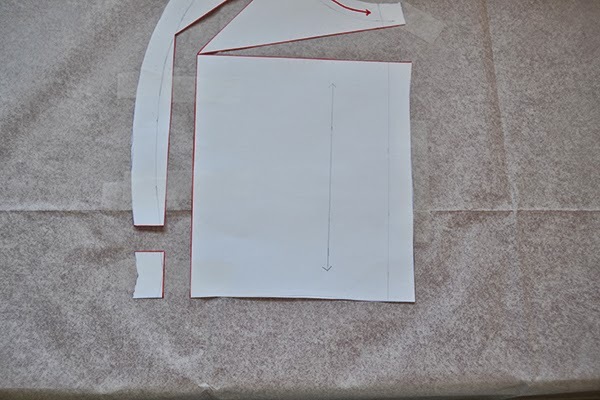 If you want to lengthen/shorten it as well, do it after the FBA so that you modify all the bodice pieces the same way. 1. 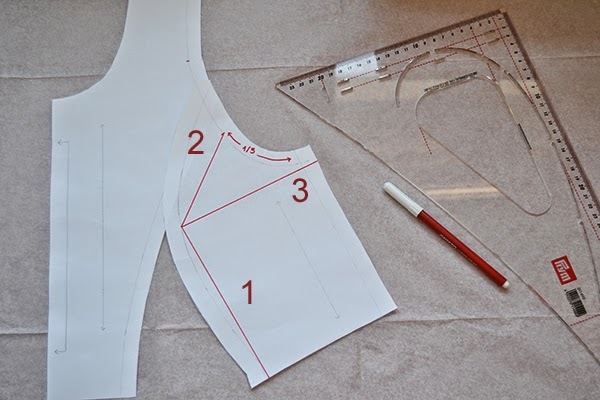 Draw a line parallel to the waistline on all the bodice pattern pieces (nº 1, 2, 3 and 4). I made mine about 5 cm (2″) from the bottom. 2. Cut along the line and place the pieces over a piece of paper. Add the length you need between each piece and tape in place. Make sure you add the same amount between all the pieces. 1. Overlap the pieces by the length you need to remove. 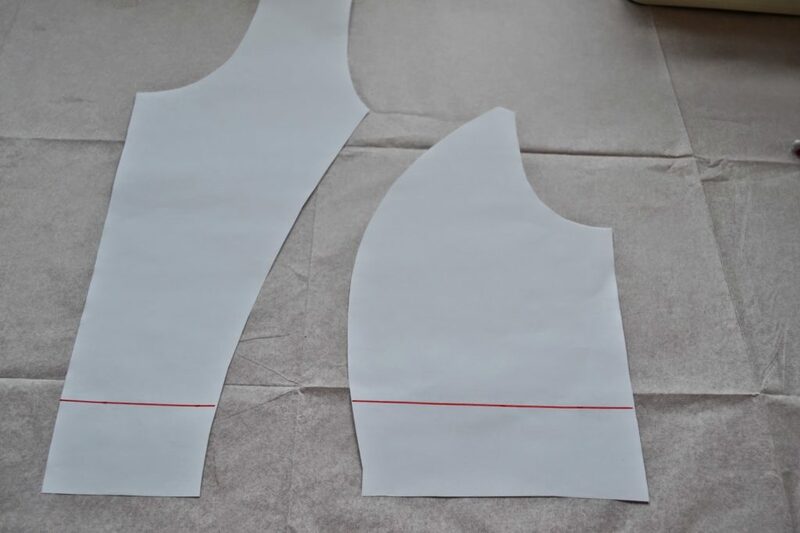 Make sure you remove the same length on all the bodice pieces. Tape together. 1. With a ruler, connect two lines together (in red 40-42 and in blue 42-46 for exemple, but not more than an 2 size difference) by drawing a new line from the top to the bottom. 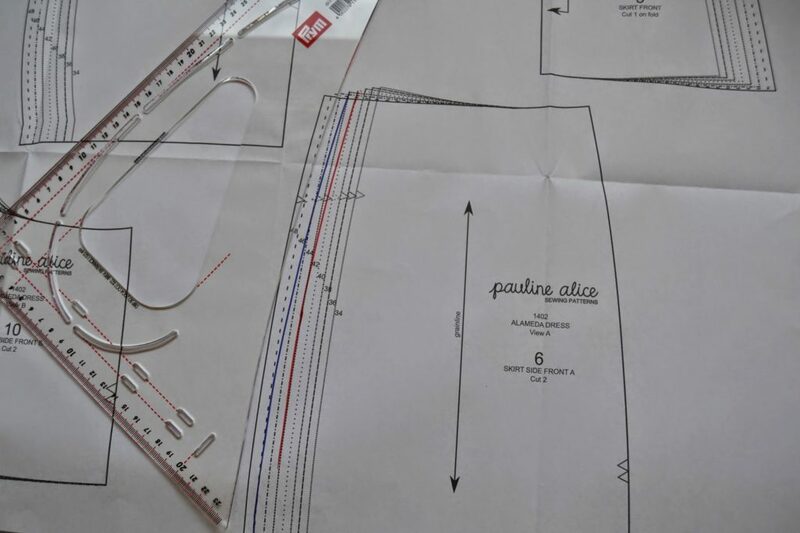 Repeat this step on all the skirt pieces and don’t forget to change the marks placement. There you go! 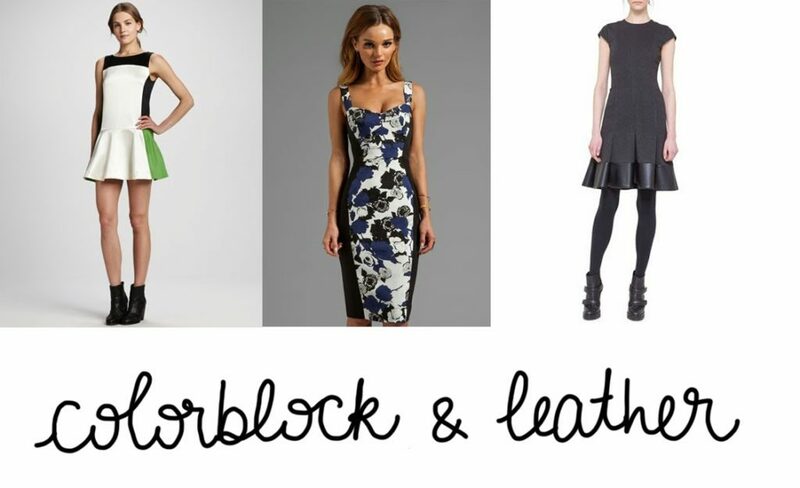 These changes were quite easy and will help you get the best possible fit for your Alameda dress. 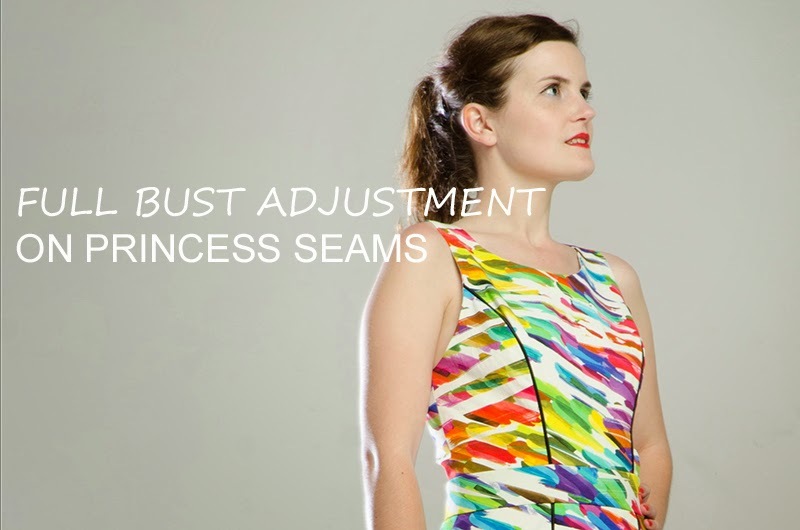 Today we’ll see how to make a Full Bust Adjustment on the princess seam of the Alameda dress pattern. But first, you might be wondering: How do I know if I need a FBA? compared to all your measurements, your bust measurements is one (or more) size bigger. when you made your muslin, you went for a bigger size for the bust but have now some extra fabric at the armscye. the waistline is pulling up at the front. Let’s take an example: Maria’s measurements are bust 92 cm (36″), waist 70 cm (27 1/2″) and hips 95 cm (37 1/4″). For the waist and hips, she should cut a size 38 but her bust belongs to size 40. 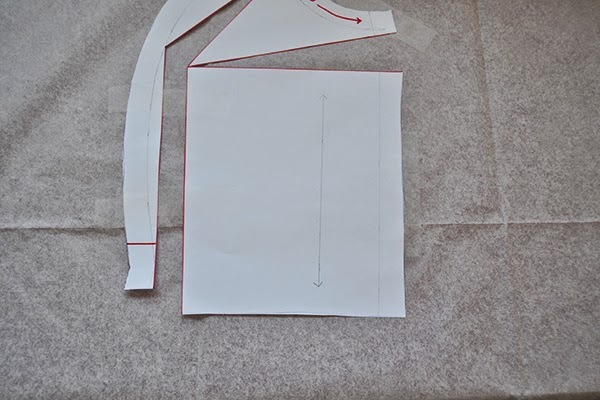 The problem if she cuts size 40 for the bust and 38 for the waist and hips is that the armscye and shoulder lines will also belong to size 40, which will be too big for her and most likely there will be some extra fabric where the princess seam starts and at the shoulder seams. 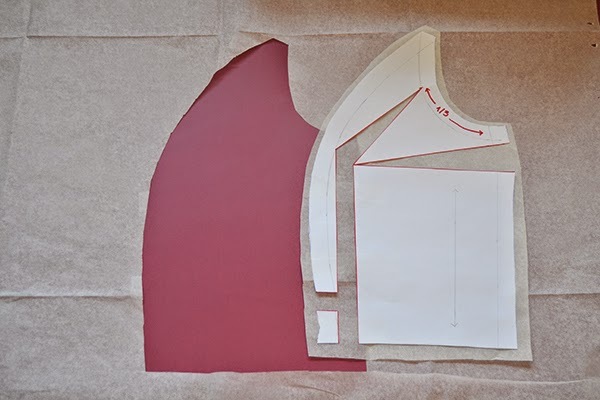 The solution is to cut the pattern pieces in 38 and add extra volume only in the bust area. And of course make a muslin before to check the fit and correct the adjustments! Let’s take Maria’s measurements again: her bust measurement is 92 cm (36″) when the one corresponding to her size 38 is 88 cm (34 1/2″), there is a 4 cm (1 1/2″) difference. 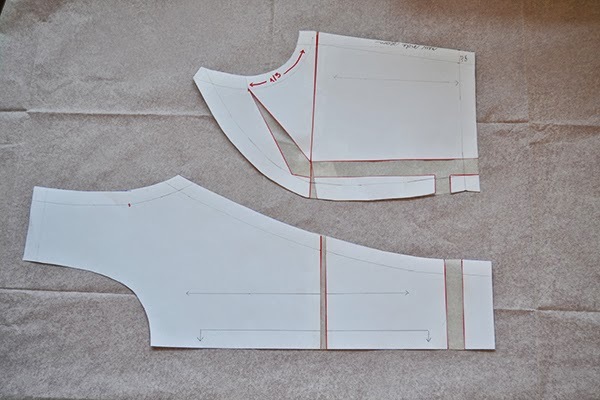 She’ll cut the pattern in size 38 and add 2 cm (3/4″) at each bust seam to make the full bust adjustment, without increasing the waistline or the neckline. 1: from the waistline to the fullest part of the bust. 2: from 1/3 of the armhole (remember that the armhole is made of the the front and side front bodice pieces) to the fullest part of the bust. 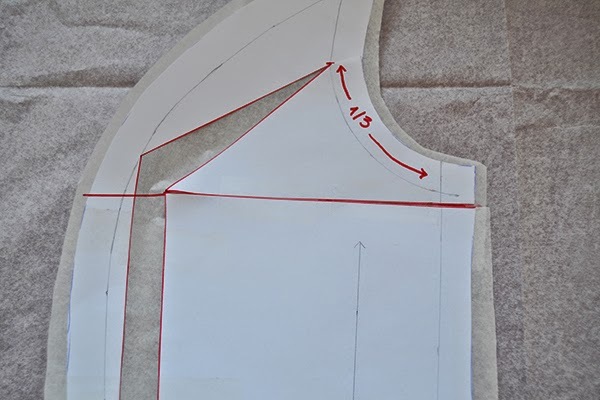 3: from the fullest part of the bust, draw a diagonal line toward the side seam allowance, like a dart. 2. 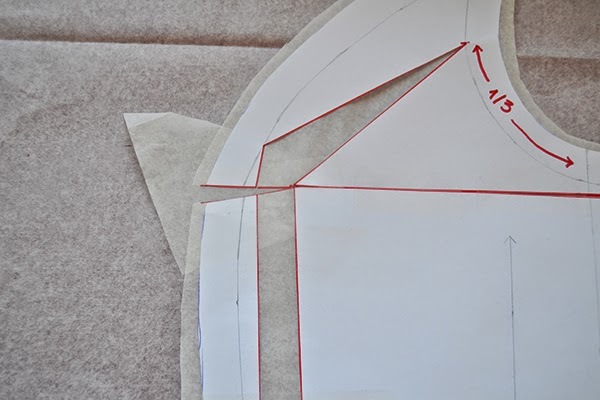 Cut lines 1 and 2 and stop when you reach the seam allowance. 3. Cut the seam allowance but make sure it’s still attached. 4. Cut line 3 and stop just before you reach the fullest part of the bust. 5. 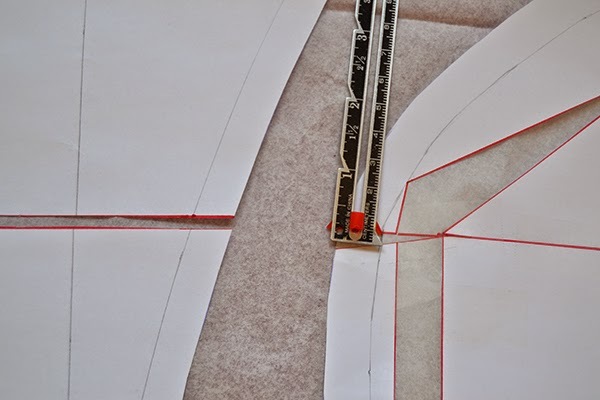 Tape the princess seam to a piece of paper and pivot the pattern along lines 1, 2 and 3 so that the opening at line 1 measures the 2 cm (3/4″) increase we need. Make sure the 2 cm (3/4″) increase is even all the way down line 1. Tape the pattern in place on the paper. 6. As you can see, the waistline is not even. 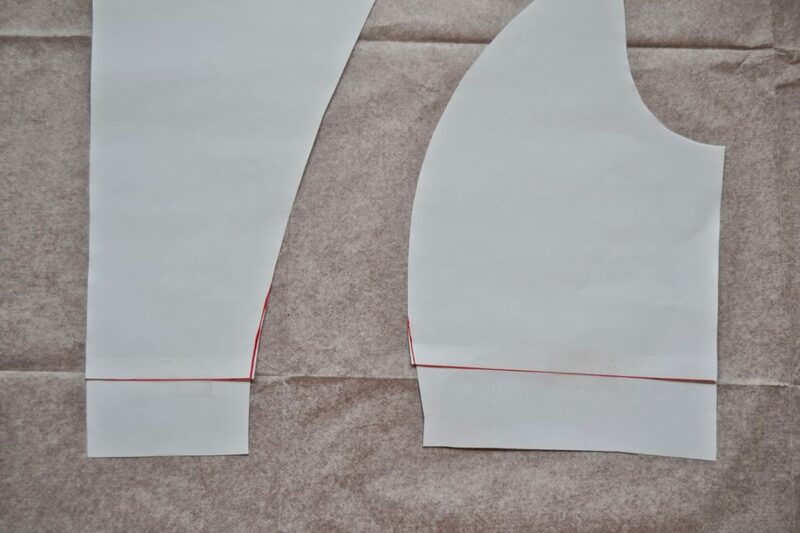 Draw a line parallel to the waistline on the princess seam part. 7. 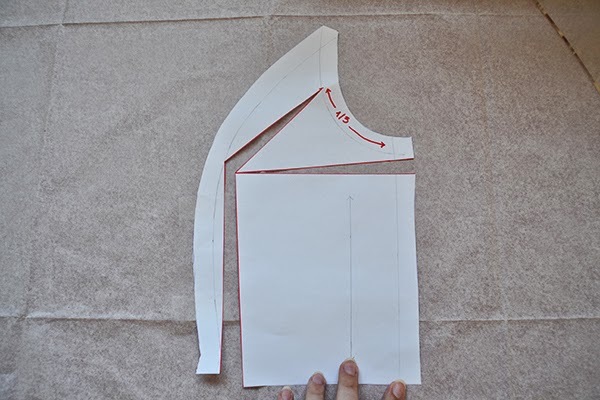 Cut along the line and place the small piece on the continuity of the waistline, 2 cm (3/4″) from line 1. Tape. 8. Cut roughly around the new pattern piece. 9. Draw a line extending line 3 to the princess seam. 10. Cut along line 3 until you reach the first pivot. Close the “dart” and tape. 11. Cut the line 3 from the princess seam to the pivot. Place a piece of paper under the spread “dart” and tape. 12. 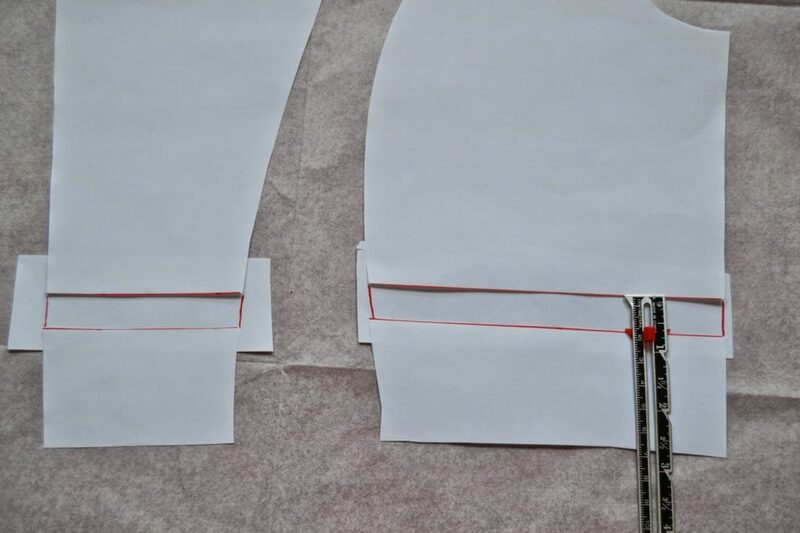 We need to take 2 cm (3/4″) in at the side seam to keep the waistline the original width (this is the measurement we added at the bust). 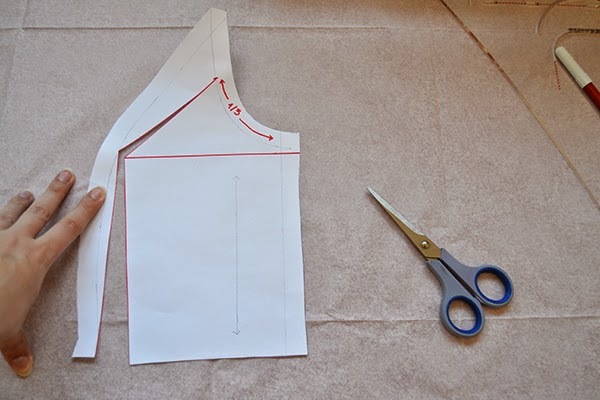 Draw a new side seam starting from line 3 and ending 2 cm (3/4″) from the waistline edge. 13. Now we need to add the increases we made to the side front piece to the front. Trace 2 lines at the same level you made the increases. 14. 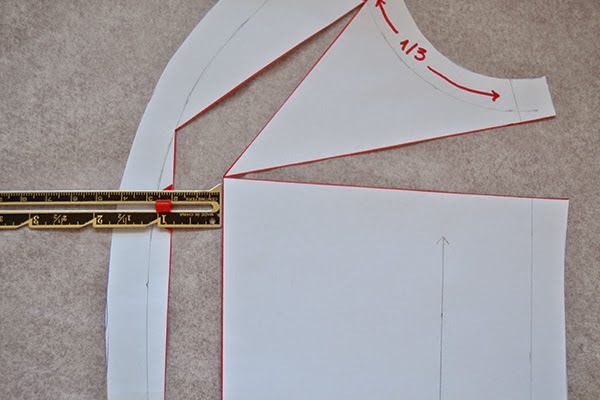 Measure how much you added to the side front piece and report that on the front piece. 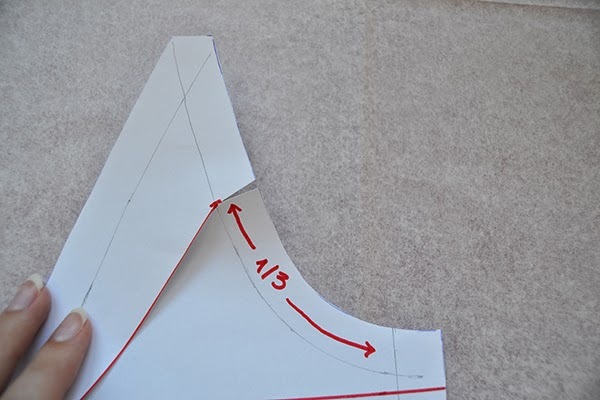 For the bust, measure the seam allowance line, not the cutting line. 15. Here you go: your new pattern pieces! We have increased the bust area without touching to the waistline, armhole or neckline. Are you going to make a FBA? How do you feel about a Sew-Along? 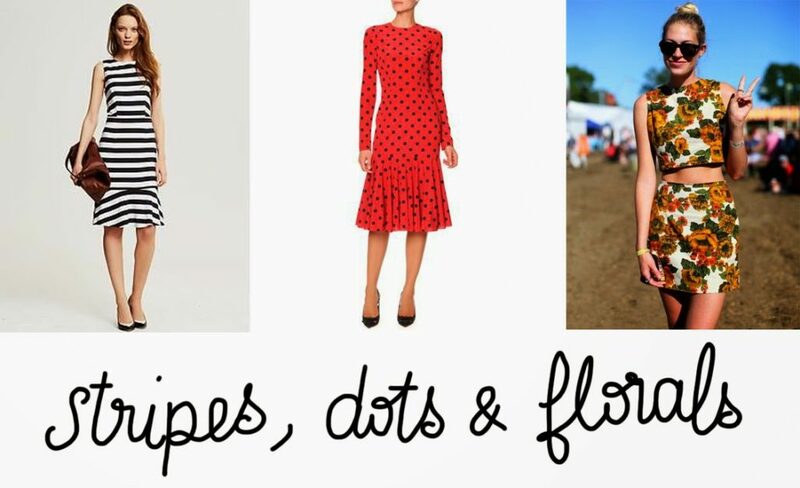 You’ve been asking for one for the new pattern, the Alameda dress, so I thought I would repeat the experience and prepare some videos for you like for the Carme blouse (you seemed to like it, no?). The Alameda dress is not difficult, it’s an intermediate seamstress level, but I think a beginner with good bases would be more than ready to make it. The more complex steps are adding the piping to the princess seams, stitch the lining and the invisible zipper. And with the help of a Sew-Along, no need to fear these techniques. 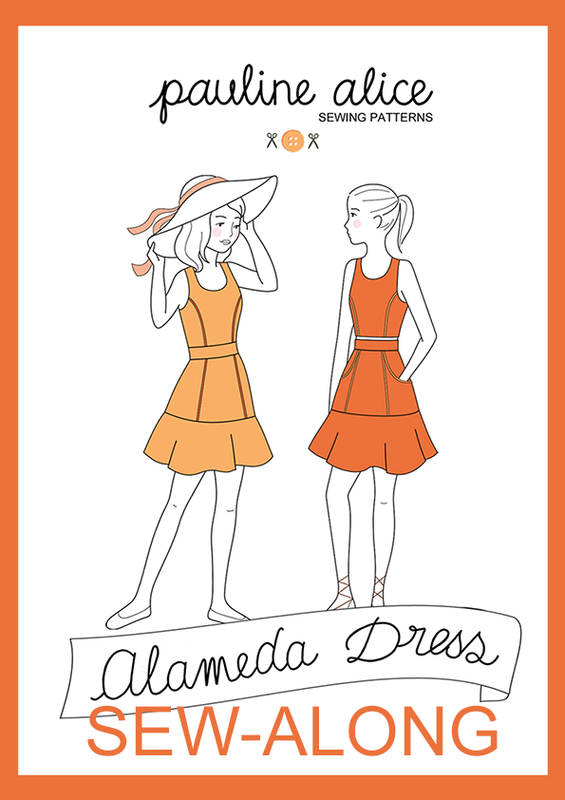 Grab your Alameda Sew-Along button, prepare your hastags #AlamedaSewAlong, get the pattern if you don’t have it (Alameda Dress pattern) and #paulinealice and start thinking about your fabric. We’ll talk about that on Monday, July 21st for the official start of the Alameda Sew-Along!